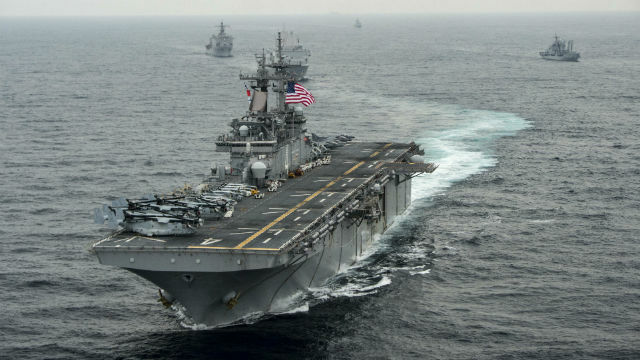 The ships, sailors and Marines of the San Diego-based Boxer Amphibious Ready Group edged closer to home Thursday as they entered eastern Pacific waters overseen by the Third Fleet, according to the Navy. The 4,500 personnel aboard the amphibious assault ship USS Boxer, amphibious transport dock USS New Orleans and amphibious dock landing ship USS Harpers Ferry have been away from San Diego since Feb. 12. The Navy did not announce when they’ll arrive home. The Fifth Fleet covers the Middle East and Seventh Fleet the western Pacific. The deployment included strikes against Islamic State targets in Iraq, maritime security operations in the Gulf of Aden and Persian Gulf, numerous exercises with naval partners and visits to 10 countries during port calls, said Col. Anthony Henderson, commanding officer of the 13th Marine Expeditionary Unit. Choppers from Helicopter Sea Combat Squadron 23, based at Naval Air Station North Island, are also on board the ships. The USS Boxer is named after His Majesty’s Brig Boxer, a British vessel captured off the coast of Maine in 1813 during the War of 1812. The USS New Orleans is named after the city in Louisiana and the War of 1812 battle that took place there.